This pendant light was made by covering an old shade with an eyechart, add a little trim and you're done, instant Drs office chic. Pic from Real Simple. Never forget where you left your glasses again. 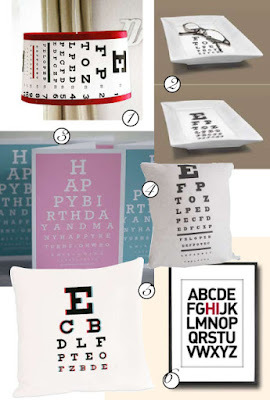 When glasses are in the tray the eye chart is in focus, when they aren't the text appears blurred. Unfortunatly only a concept at the moment from Fiona Carswell. Keep your eye out for it though. Multifunctional cushions. Add comfort to your home and keep a check on who might need glasses. $35 from Melbourne designer Aunty Cookie. Heather Lins Home even throws in a pair of 3D glasses with their pillows! Not quite an eye chart, but eye catching all the same. This cute $15 poster is from Melbourne based The Love Shop.